THIS IS A GIFT CERTIFICATE THAT WILL BE MAILED TO THE ADDRESS SHOWN AT PURCHASE. To make other arrangements call our office Mon-Fri 1-5pm at 801-854-1799See the terms that apply to all deals. Fresh and flavorful! 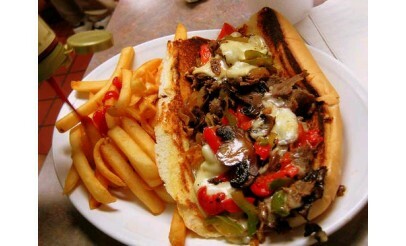 The BEST Cheezsteak in the County! We use the highest quality meats and stuff our freshly baked bread full of your favorite choices. You will come back again and again. We also serve daily soups and salads. Fresh breads and meats make up your favorite sandwich right before your eyes!! Many specialty sandwiches to choose from or create your own! Also serving soup, salads, fries and chips. Come have lunch with your co-workers or grab a bite to go! !